The Vionic Gemma Plush Slippers are an ultra soft closed toe slipper with a sturdy rubber sole, luxuriously designed from heel to toe. Designed with a soft faux fur footbed and upper surrounds your foot in softness to reduce pain caused from flat, hardwood floors. Available in colors Black or Blush and sizes 5-9. Vionic Relax Plush Slippers, featuring a savory plush faux-fur footbed and a velcro adjustable upper for a flawless fit. Choose from a beautiful plush Black or Blush color in sizes 5-9. 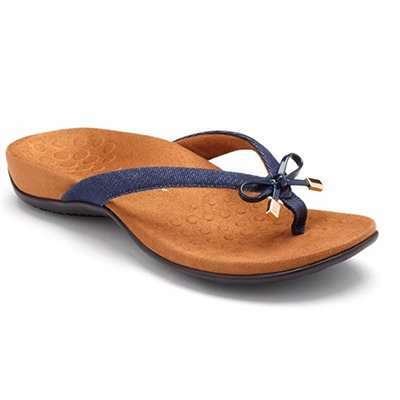 The Vionic Tide Rhinestones Toe Post Sandal is a stylish flip flop with rows of tiny rhinestones. Easy to slip on and off, and features the Vionic Orthaheel Technology for proper natural alignment. Lightweight, flexible and proven to alleviate heel pain.